While I consider myself a fairly seasoned home cook, dessert has never been my jam. Preparing desserts always blows up my kitchen. Mixers to wash, flour and sugar everywhere. Forget it. Especially if I’m hosting and hoping to keep my kitchen in order. This may be a little selfish, but I don’t have much of a sweet tooth. Is wine tooth a thing?? I definitely have that… Anyhoo, lets continue. I’m not very patient or exacting when under pressure. Dessert is not a regular thing in our house, so when I’m making it, I’m often hosting. Precise measurements, waiting for the butter and eggs to come to room temperature that you inevitably forgot to temper; who can really manage all this when guests are expected? Well Martha probably, but not this gal. Yet, since dessert will always be part of a hostess’s life, it’s good to have some simple recipes in the bag (even if just for back up when trying out something new). I’ve come to rely on the following no-fail, three-ingredient desserts that are simultaneously easy, crowd-pleasing, and chic. Sparkling Sorbet: This is the easiest dessert, and also my favorite. Add a few scoops of your favorite sorbet (I usually go with raspberry and lemon) to a beautiful glass, top with a generous splash of prosecco, and garnish with a sprig of mint. Go virgin by swapping sparkling water for the bubbly. Affogatos: Drizzle freshly brewed espresso over vanilla ice cream or gelato, finishing with a sprinkling of chopped chocolate covered coffee beans. This is a particularly perfect dessert to accompany an Italian-themed meal. Lemon Tartlets: Fill pre-baked tart shells with store-bought lemon curd, then top with fresh blackberries or blueberries. The sweetness of summer in a delicate bite. Plated Pound Cake: Slice and lightly toast store-bought pound cake, then top with whip cream, and either a drizzle of honey or fresh fruit. A modern spin on an old-fashioned favorite. 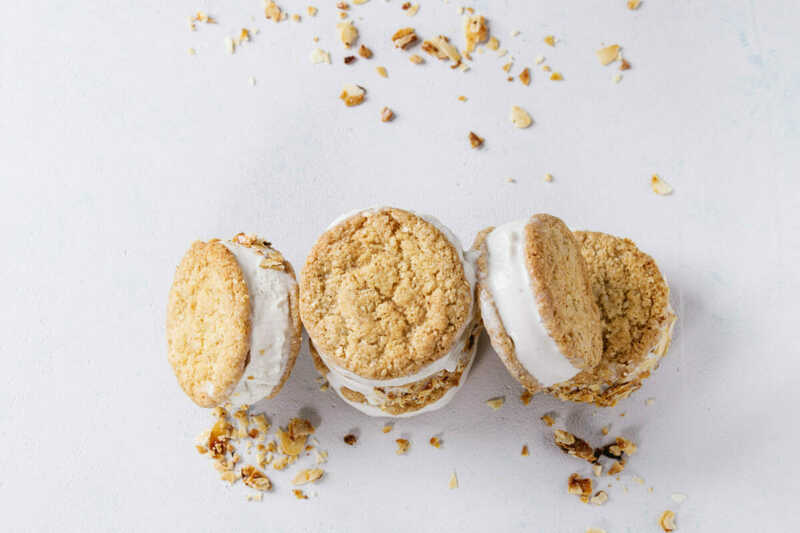 Ice Cream Sandwiches: This will probably be the winner with the kiddos, but is a dessert everyone loves. Sandwich a scoop of slightly-softened ice cream between two cookies, then roll sides in topping of choice (my favorites are mini-chocolate chips or sprinkles). These can be made ahead and kept in the freezer, or let everyone build their own with a mix of cookies, ice cream flavors, and toppings. Hosting a dinner party anytime soon? Next time dessert is on the menu, remember you can pull off a simple and elegant dessert without the stress with any of these five favorites.